All of our metal detectors and geophysical detecting instruments are part of the “FS – Future Series”, a line of our latest technology to detect buried objects and underground structures. Beside the measuring instruments it includes our 3D software which assures a detailed analysis of the measured results. The metal detector Evolution detects gold and silver. Control unit of Evolution with full color touch-screen. The operating mode ‘Live Sound’, which uses the VLF metal detector option to scan for metal objects like gold and silver. The operating mode ‘3D Scan’, which is used to scan a whole area for hidden objects like metals and caves. The user interface of the 3d metal detector Evolution is available in many different languages. Several settings of the ground scanner (e.g. the volume of the internal speaker) are adjustable via touch-screen. The device “Evolution” is the best introductory model to step in into the world of 3d ground scanning. 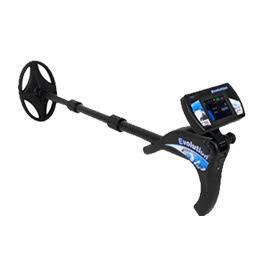 It easily combines common metal detector technology with high performance ground scanner technology.